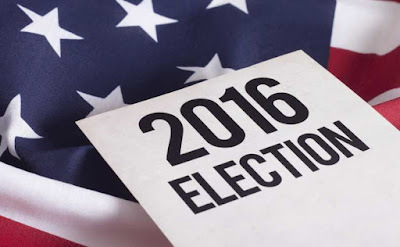 I wanted to take a few minutes to share just a couple election tips for the US election coming up on November 8. Please keep in mind that I am an election inspector in Michigan - if something sounds completely wrong to you, please clarify with your local government's website. My first tip is one I've given a few times recently on Facebook. I realize a lot of Americans are not thrilled with the presidential candidate options available. While that is literally all I'll say regarding the candidates, I need you to know that writing in someone who has not completed the correct steps to be a valid write-in candidate is useless. And beyond being useless, it creates a ton more work for election workers in your precinct. See, the ballot scanners will pick up that there's a write-in, but they can't read. So at the end of the night, the election workers will need to go through ALL of the ballots until they find the ones with write-ins. If the write-ins are not valid write-in candidates, this is giant waste of time. Please, do not write-in an invalid write-in candidate. Also, if you are writing in, please be prepared to actually write-in - we've been told that using a label or sticker may jam the machine. Where are you supposed to vote? Maybe you vote at every election, so you know where to go. That's great! If this is the first election where you want to make your voice heard, be sure you know where to go. This information is usually available through your local government website by putting in your address or other information. Do it before election day in case you're surprised. And if you're ever not 100% sure if you're going to the right place, go early enough that you have time to go somewhere else if necessary. The ballots can be different at different precincts because of school districts, city lines, or other regional votes. If an election inspector tells you you're in the wrong place, they'll probably also tell you where you should be. Being mad at the election inspectors, or even being sure you voted at that place last time doesn't change the fact that they do not have a ballot for you. You need to be in the correct precinct to vote, and it's your responsibility to get there if you choose to vote. -you are appointed to work as Election Day inspector in a precinct outside of your precinct of residence. This is also a great option for anyone requiring assistance to vote. You can do what you need to in the privacy and comfort of your home. While I won't count it as official advice, please be polite and respectful to the election inspectors you encounter. It's a long day and potentially stressful. We're doing the very best we can to make sure that everyone who wants to vote can and does. Interesting re: the write-in candidates advice. I just moved recently so I've already mapped out where my new precinct is :). Interesting to know. This has been a crazy election. Great advice! I can't image waiting in a big line only to find out you were at the wrong precinct.